We told you earlier this week that ASUS Germany had hinted that a Jellybean update was “currently planned” for The Eee Pad Slider and the Eee Pad Transformer. 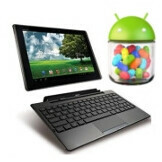 Now ASUS has confirmed to Droid-Life that Android 4.1 Jelly Bean will be rolling out to the Transformer Pad, the Transformer Prime, and the Transformer Pad Infinity in “the coming months”. At ASUS, one of the key commitments we make to our customers is a relentless drive to deliver the best user experience. We constantly strive to achieve this goal through our ‘Design Thinking’ philosophy that includes regular software and firmware updates for our products. We are pleased to announce that many of our tablet products are scheduled to receive an update to Android 4.1, Jelly Bean. The ASUS Transformer Pad, ASUS Transformer Pad Prime and ASUS Transformer Pad Infinity are all scheduled to receive Android 4.1 updates in the coming months. We will provide further guidance on our expected timeframes for these updates near their release. We are still investigating Jelly Bean updates for other devices, but we are not in a position to confirm whether any other products will be eligible for an update at the moment. Given that the letter promises an updated timeline once the OTA’s get closer to their release date, we suspect that like most OEMs ASUS is still trying to figure out how quickly they can port Jelly Bean to their ICS-based devices. It appears that the process should be much faster than the update cycle from Gingerbread to ICS, but that’s not really saying much. At those of you who bought ASUS’s recent tablet models know that your purchase is future-proofed for a while yet. Alright, good. I ordered the Pad Infinity + Dock this morning and I can't wait for Jelly Bean! This includes the transformer pad 300 right? It includes all of them. Okay awesome. It's a beast on Ice cream sandwich, I can't wait for jelly bean. f**k yes! this made my day. Asus is the second best company in the world,the frist is google.